If you can dream it, you can build it here. 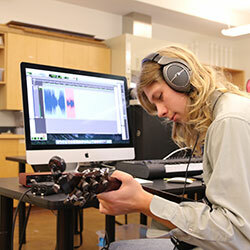 If there is a project you are thinking about – the resources to make it happen exist in NYA’s innovation lab. The lab, located in the Mertz Science Center on NYA’s campus, contains resources to promote innovation and integration of technology across the curriculum in grades kindergarten through 12. See a list of all tools available. NYA has always recognized the importance of fostering critical thinking, collaboration, creativity, and real-world problem solving skills. This environment supports the development and advancement of these skills. Whether individual or group projects, students have the resources and space at their disposal to tinker, build, compose, explore, and discover. What students choose to work on here will greater prepare them for challenging college careers in the 21st century landscape and beyond. Educational tools in the innovation lab open up a world of opportunity. 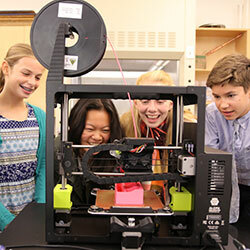 Powerful computers, hi-resolution printers, a 3D printer, design software, filmmaking and music recording equipment, VEX robotics hardware, tools, building materials and more are all available for use as students explore and create. The lab is also home to our robotics team with a full size VEX competition arena and dedicated space to store their builds. 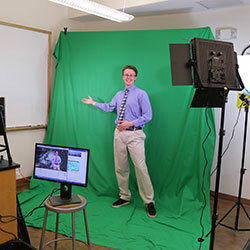 In the video below, Middle School art teacher Tim MacMahon ’93 finds himself on a wild bicycle adventure through time and space while trying to deliver a simple message across campus in the film, “The Messengers.” The film was created by NYA Technology Coordinator Dave Gagne as an example of green screen technology for students entering the winter short film competition.